I was so excited because earlier this week, I got a library card for the library just outside of campus! Now, I can get new(ish) releases and keep up with them while I'm at school! I got this one because I remember seeing it around A TON and loving the cover. I've seen some mixed reviews for this one, but I guess we'll see how I like it! That's it for mine! 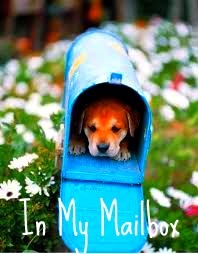 What did you all get in your mailbox this week? This book is awesome! I hope that you enjoy it. I heard that this book is really a fantastic read. I haven't read it yet but I think I need to check out a copy of it sometime. hope you enjoy reading it! I cannot wait to read that book! I hope to check out your review for it. I have had this book on my TBR list for ages, I should probably get round to it soon! I hope you enjoy and that you like your local library. OOoh nice! I loved The Girl in the Steel Corset! It was very entertaining! Happy Reading! That book is on my wishlist, I love the cover! I also love the cover to the next book! I hope you enjoy your book, and congrats on the library card! Thanks for sharing and for stopping by my IMM today! Thanx for stopping by my blog! Personally I really loved 'The Girl in the Steel Corset', I hope you'll enjoy it as well ! I'm very excited about the sequel, 'The Girl in the Clockwork Collar'. thx for stopping by my IMM!! :-) I love this cover, definitely. Looks like a good week!! I keep hearing how great this book is and I've yet to read it. I hope you like it! I've seen this one around a lot too. I can't wait to see what you think! I've been meaning to get this book for months now, but I always end up passing it up. >.> I will get it eventually though. :P Really hope you enjoy it. I really liked this book and I hope you do too! The sequel should be coming out in May and I can't wait. Thanks for stopping by. Ooo...this is one I've heard lots about and it's on my virtual TBR pile (I don't have a copy of it, but I'm sure my library does). Hope you enjoy! Thanks for stopping by and weighing in on the book choices at What She Read, Jessica! I love your blog's title and I'm enjoying poking around a bit here. Your 'catch' this week looks like so much fun! Thanks for dropping by my IMM! I've been wanting to read that one for a while! I can't wait to see what you think! That is such an amazing cover. I haven't read it yet but it's in my tbr pile. Hope you enjoy! I got a huge haul from my library this week too! Seriously, libraries are sorely underrated:) I adore Steampunk, probably my favorite emerging genre out there, and I have been wanting to read The Girl in the Steel Corset for a while. Maybe my library will carry it soon too! Hope you enjoy your reads! Great week! I've always wanted to read Girl in the Steel Corset. I've also heard mixed reviews on it, though the story seems interesting, I hope you enjoy it! and Thanks for stopping by my blog :D! Yay for the library - I'm a big fan. 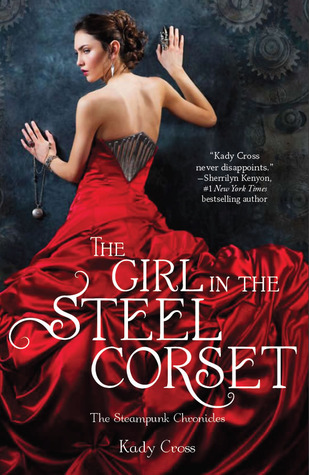 Girl in the Steel Corset looks like a cool read. Hope you enjoy it! That IS a great cover, isn't it? You'll have to let us know how you like the book! Thanks for this information, I think it will come in handy in the future. Why pay someone to do my homework ?